WITH A rich history dating back more than 300 years, it stands to reason that brandy has been used in many a vintage cocktail. Shaking it. 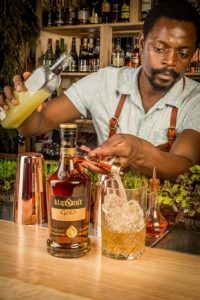 Barman Michael Mudzenda shows how a Klipdrift Gold cocktail is done. But thanks to Kurt Schlechter, innovative mixologist and owner of brandy-centric experiential cocktail kitchen, Cause Effect in Cape Town, the spirit is firmly back in the spotlight. Grab one of South Africa’s finest potstill brandies, Klipdrift Gold, and get shaking – barman Michael Mudzenda shows how. Klipdrift Gold and SLM are giving away TWO LIMITED EDITIONS each. * Klipdrift has a rich history dating back more than…? * Name the barman who creates that golden touch? Send answers, name and contacts to info@sowetolifemag.co.za or Sydney@sowetolifemag.co.za, on or before March 29 2018. Ts & Cs do apply! No under 18s must enter this competition.